Note: You need to first create a form in Rainmaker before you start creating/ editing your Icegram campaign. Step 1: Create a new campaign / Edit previously created Icegram campaign. Step 2: Fill in all the message details as per your requirements. Step 3: In the Form section below Message Body textbox, check the box that says “Use Opt-in / Subscription / Lead capture form“. This will open up additional settings. Step 4: Choose the form style. 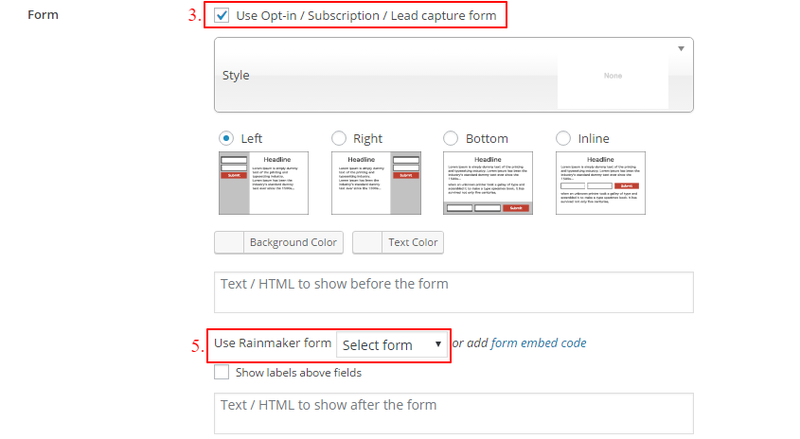 Step 5: Select your Rainmaker form from the Dropdown in the option that says “Use Rainmaker form“.